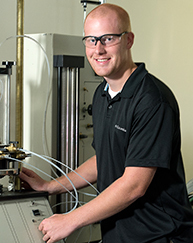 The Bachelor of Science in Civil Engineering degree at the University of Mount Union prides itself on providing individual attention to help students become proficient in structural, hydraulic, and environmental engineering, among others. Our civil engineering program is accredited by the Engineering Accreditation Commission of ABET and provides students with hands-on experiences and internship opportunities throughout their undergraduate career. Civil engineering, along with mechanical engineering, are currently offered at the University of Mount Union as four-year ABET accredited degree programs. The University recently added three new engineering programs – biomedical, computer, and electrical – that will begin in the fall of 2018. The mission of the civil engineering program is to provide a comprehensive, rigorous, hands-on engineering education in a quality and conducive learning environment; providing students with the skills and competencies necessary for employment or career advancement as civil engineers. Our graduates will be equipped for life-long learning necessary for professional practice and advanced studies. We will prepare our students to be the technical, business, and global leaders of tomorrow. Technical and Engineering Skills – Graduates will be able to apply mathematical, scientific and engineering principles in the design, analysis, experimentation and testing of computer devices, components, subsystems and software using appropriate tools and techniques. Professional and Leadership Skills – Graduates will be able to recognize and achieve high levels of professionalism and attain careers in which they assume leadership positions, work in multidisciplinary teams, make decisions that are socially responsible, and communicate effectively. Taught by our outstanding engineering faculty with expertise in the many fields that make up civil engineering, you will start your college career with general education courses in chemistry, physics, calculus, and an overall view of the engineering profession as well as analysis and design. Throughout your years at Mount Union, you will engage in our dynamic curriculum that is strongly focused on real-world application. You will gain hands-on experience through a required international experience in the field as well as through the engineering capstone design course. Civil engineering graduates are typically among those with the highest starting salaries. According to Bureau of Labor Statistics, civil engineering is projected to grow 20% over the next decade. Students at the University of Mount Union will be prepared to work on planning, designing, constructing, or maintaining a number of structures including roads, bridges, airports, tunnels, dams, and water and sewage systems. Civil engineers have the option of working for local, state, or federal government agencies, as well as private practices. In the future, I know I can count on most of the people I've met here to still be active in my life as references and support. The liberal arts education that Mount Union provides has helped me to be more well-rounded as an individual and as a professional. Pretty early on in my teaching, I realized that it wasn’t enough to simply teach a subject. Rather, my role is to grow people. Building successful, young professionals means caring about - and pushing - each one of my students.